This hand crafted custom leather holster is made from genuine 7-8 oz. veg tan cowhide and is hand stitched with heavy duty waxed nylon thread or hand laced with premium calf skin lace. Specify color of stitching from black, white, brown, blue, or red; specify color of lacing black or brown. Cartridge belt is also hand crafted from 7-8 oz. veg tan and has adjustable bandolier for 12 cartridges- pre-punched strap for bandolier adjusts to fit any caliber size. Customize with your choice of color, tooling, and size (based off of frame and barrel length). 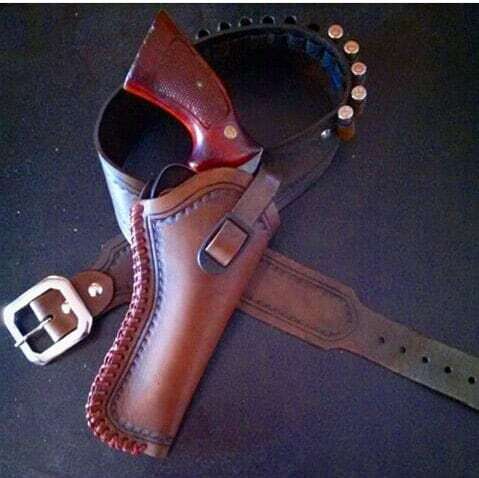 Holster attaches to included cartridge belt by belt loop on the back of holster or any other belt up to 2 1/2 inches. Can be used for standard draw or cross draw. *Specify right or left handed in notes when ordering. *Send specific instructions or image in JPEG or PDF for custom tooling for both holster and cartridge belt.